Young artist's tragic death impacts and inspires community. Nathan McClain was an accomplished Illustrator who died unexpectedly and tragically in 1997 at the age of 24. 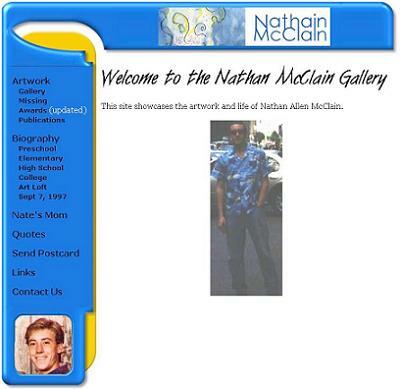 In the summer of 2003, the Nathan McClain Gallery Web site (http://www.natemcclain.com/) was created as an on-line gallery to showcase his artwork and to be a memorial to his life. The Web site was established primarily for family/friends to share stories about Nathan and comment on his art. Since the launch of the Web site, the Nathan McClain on-line gallery has reconnected friends, mobilized grassroots efforts, and inspired the art community. In order to understand how the Nathan McClain Gallery Web site (http://www.natemcclain.com/) has impacted and inspired communities, it is crucial to know about the brief life of Nathan McClain. Nathanial Allen McClain was born August 6, 1973 to David and and Lynn McClain. Nathan was an only child and was raised in Granite City, Illinois, near St. Louis, Missouri. From as early as 4 years old, Nathan began showing talent as an artist and created his own custom "greeting cards" that he would share with his family. His mother, Lynn, was an artist and was a major influence and encourager of Nathan's abilities. As he went through school, Nathan's artistic creativity continued to expand and he always seemed to have a crayon, pencil, or marker in his hand. Nathan had a natural fun-loving spirit and a charisma that made everyone want to hang around him. Consequently, he was known and respected throughout many different social circles. Throughout high school and college, Nathan had a number of girlfriends. Nathan attended Southwest Missouri State University (SMSU) in Springfield, Missouri, joined the Delta Chi Fraternity, and in 1995 obtained a Bachelors of Fine Arts degree with an emphasis in Illustration. In late 1993, Nathan's mother Lynn died after a short 4-month battle with cancer. Lynn was Nathan's biggest supporter, and her sudden passing profoundly affected Nathan as well as his artwork. His color choices seem to become darker and his themes harsher. After completing his art degree, Nathan spent some time in the Northeast and he returned to live in the Art Lofts of downtown St. Louis with a childhood friend David Edwards. While in this environment, Nathan continued to produce artwork and his loft apartment became a major gathering party spot. 1997 was a banner year for Nate. He put together an art showing with other Art Loft artists, he traveled to New York City, he took a road trip to California, and in late August he began interviewing for Illustration positions. Nathan attended the wedding of two SMSU college friends, Rob Johnson and Lisa Anderson. The wedding was in Louisiana, Missouri on September 6th. Shortly after the wedding reception, Nathan and some others were going to dive off a nearby bridge into the Mississippi river (it was after midnight). Nathan, a certified lifeguard, was the first to dive and he never surfaced. Authorities later found his body downstream. Nathanial Allen McClain had died at the age of 24 on September 7, 1997. The day after Nathan's death, a large number of his friends returned to his apartment at the Art Loft and practically lived there until the wake and funeral. Many memories and tears were shared during that time; there was a feeling that an era was ending. After Nathan's funeral, the friends went their separate ways. Some bonded closer while others wanted to be left alone. There was a noticeable void left after Nathan died. During this time, one of Nathan's closest friends, Kristopher Barks, shared a vision of an on-line gallery for Nathan's artwork. Kris worked as a software developer and had grown up with Nathan for 20 years – they were like brothers. Nathan's death hit Kris especially hard which resulted in the on-line gallery concept being abandoned for 5 years. Nathan's Family– his Father, grandparents, cousins, etc. After designing a site layout and agreeing on the Web site name, it was time to share the details to begin acquiring the necessary content of art pictures and snapshot photos. One of the first people to hear the details was Nathan's family - his father David McClain and his grandparents Eva and Willis Shepard. Nathan's family was (and still is) extremely supportive of the site and gave their approval. After Nathan's family, each of the key people within the various communities was contacted and their help solicited. Initial meetings were primarily in person, and everyone was on board from day one. Everyone was encouraged to spread the word about the Web site and assume people did NOT know about it. To help generate enthusiasm for the site, a teaser page was created so people had something to view. In a fairly short timeframe, the people who knew Nathan were getting back in touch with each other, "lost" friends were being found, and anticipation was building. Once the community became involved, most of the initial challenges of identifying and locating family, friends, artwork, and snapshots began to melt away. Since Nathan was the center of many spheres of influence, emails started flying, with digital picture attachments of artwork and snapshots as well as words of thanks and encouragement. During the pre-launch phase, people who didn't even know Nathan started getting involved. The site needed to be professional and have graphic designs. Collaborations were made to create a shell of a site, locate a Web host, and create the logo. a graphic artist who was saddened to hear Nathan's story designed the logo based on one of Nathan's art pieces. Today, August 6 2003, Nate would have turned 30 years of age. P.S. A huge thanks to everyone who has contributed so far and I am looking forward to receiving additional Art and Photos to make Nate's Gallery complete. The Nathan McClain Gallery Web site (http://www.natemcclain.com/) was successfully launched and now contains 69 pieces of artwork and 54 snapshot photos. The feedback was extremely positive, and some people stated it helped them have closure. There are friends of Nathan who had drifted apart but have reconnected because of the Web site. One of the features implemented was the ability to add comments to each piece of art and to Nathan's biography. These comments have had the unexpected result of adding a "heartbeat" and warmth to the site. The friends of Nathan have been discovering the site by word of mouth and on-line searches and have helped to expand the virtual community. The Web site averages 15,000 hits a month. Nathan's Web site is registered with the major search engines and appears on art related sites that list Nathan in their artist list. In the Spring of 2004, the Southwest Missouri State University chapter of the Delta Chi fraternity found out about Nathan's Web site and his death. They were so moved by his story that they wrote a feature article about Nathan in their Spring newsletter. Prior to Nathan's death, he created a sports mural on the wall of a sporting goods store named Ultimate Sports in his hometown of Granite City, Illinois. As part of tracking down Nathan's artwork for the Web site, the sports mural was rediscovered in 2003; however, the sporting goods store was out of business and the building abandoned. In September 2004, we learned that the building containing the mural was scheduled to be demolished the next month (October). This required immediate action to save the mural from demolition. The demolition foreman was contacted and he was very sympathetic to the situation. The foreman got authorization to allow the mural to be extracted from the building prior to demolition. The mural was on a 16' by 8' wall and was too large for an individual to keep in a home. Since the mural was already in Nathan's hometown and it had a sports theme, the local high school was contacted to see if they wanted the mural for their gymnasium. The high school was very supportive of the idea; however, the school did not have space to accommodate a mural of such a large size. Undeterred, the next stop was Coolidge Middle School. The principal, Rick Talley, was excited about receiving the mural and would find a place for it. The challenge would be the extraction and transportation of the mural. After some investigation with the school superintendent, Rick discovered the cost of saving and preserving the mural would be around $500, a sum not in the school's budget. Rick said if the $500 dollars could be raised, then the school would be able to preserve the mural. The building that has one of Nate's paintings is being TORN DOWN next week. We need to raise $500 DOLLARS to transport and preserve this painting at Coolidge Middle School. We are accepting donations of any amount to keep this Artwork from being blasted to bits. TO HELP, call me or email me at admin@natemcclain.com. Because of the mural preservation effort, the art community became aware of Nathan McClain and they have been moved by Nathan's "tragic artist" story. The pieces displayed on-line are a cross-sectional representation of the artwork Nathan produced, with additional pieces regularly being uncovered and added. As the artwork gallery expands, the art community is gaining an appreciation of the natural talent and potential Nathan possessed. Nathan's artistic influence is not limited to those who are just now getting familiar with his work. One of Nathan's art pieces displayed in his high school inspired a girl (whom he didn't know) to become an artist and art teacher. Through his artwork, Nathan shared the best of himself, and his creative legacy will now live on-line for the world to appreciate. Nathan had an amazing artistic gift at such a young age, and he continued to be a vital creative force right up until the end. He is greatly missed by all who were privileged to know him. All past and future success of the Web site is attributed to the generous support of the family and friends of Nathan. The Nathan McClain Gallery Web site (http://www.natemcclain.com/) will continue engaging people so they can discover Nathan's story and appreciate his contribution to the art community. Visit the site, admire the artwork, read the stories, and share the site with others. Copyright © 2005 - Archives & Museum Informatics - All rights reserved.